The Maritime and Port Authority of Singapore (MPA), which organised the Singapore International Bunkering Conference and Exhibition (SIBCON), continues its preparation for making the port a major centre for bunkering Liquefied Natural Gas. Senior Minister of State for Transport and Health, Dr. Lam Pin Min, spoke of this in his opening address on October 3. “MPA has made good progress on LNG bunkering in Singapore over the last few years. To kick-start the use of LNG as a marine fuel, MPA has co-funded the construction of eight LNG-fuelled vessels. The first two were delivered this year to Keppel SMIT Towage and Maju Maritime, which have since conducted a total of 15 LNG bunkering operations. We expect this number to grow as more LNG-fuelled vessels are delivered. “Outside of Singapore, MPA continues to work closely with ten other like-minded ports through the LNG Bunkering Port Focus Group. I am glad to note that the focus group will be releasing a joint timeline today, showing the readiness of each port to provide LNG bunkering facilities. “I am also happy to welcome to the focus group our first Middle Eastern partner – Suez Canal Economic Zone Authority. The growing membership will strengthen the global network of LNG bunkering facilities and give shipping lines more confidence to invest in LNG-fuelled vessels”, the Minister concluded. In his opening address, the Minister also announced initiatives by MPA to ready the Singapore bunker industry ahead of the International Maritime Organization’s 0.5 per cent global sulphur cap taking effect from January 2020 and to support R&D in alternative fuels, as well as digitalisation. MPA will forge greater international collaboration on LNG Bunkering and support the development of alternative clean fuels. In 2014, MPA formed an international focus group to deepen cooperation and information sharing on LNG bunkering. Since then, the LNG bunkering port focus group has grown from three to 11 participants. To provide guidance to the industry on the readiness of LNG bunkering facilities at each port, the focus group released an infographic jointly developed by the members (see here). Separately, MPA recently joined SEA\LNG’s membership coalition to further drive and align MPA’s efforts with the global LNG bunkering supply chain. SEA\LNG is a global coalition of players in the LNG shipping value chain who works collaboratively to drive the widespread adoption of LNG as a marine fuel. By joining SEA\LNG, MPA hopes to foster greater confidence in the availability and reliability of LNG as a marine fuel now and in the future. 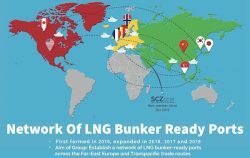 Other members of the LNG bunkering port focus group include MPA, Antwerp Port Authority, Port of Rotterdam, Port of Zeebrugge, Port of Jacksonville, Norwegian Maritime Authority, Ministry of Land, Infrastructure, Transport and Tourism, Japan, Ulsan Port Authority, Republic of Korea, Port of Ningbo-Zhoushan, Port of Marseille Fos and Port of Vancouver.